Michael Frayn’s Tony Award-winning play turned BBC film, directed here at Soulpepper by Katrina Darychuk, tackles world-historical events – the development and use of the atomic bomb, the Holocaust, and the Second World War – through the intimate lens of the relationship between brilliant scientists Werner Heisenberg and Niels Bohr: friends, colleagues, rivals, and opponents in the biggest arms race of all time. Their meeting in occupied Denmark caused a rift between the two and may have been a crucial catalyst in the development of the ultimate superweapon, but no reliable account of it exists – including from the men themselves. For a period that has been meticulously chronicled by historians and dramatists, this absence offers creative licence to writers and directors to let their imaginations run wild. In Copenhagen, the ghosts of Bohr and Heisenberg explore several variations on how that fateful day could or should have gone as well as larger questions of morality and agency. Adding a fresh mystery to history’s most important conflict should be an easy recipe for success. Sadly, Copenhagen tries to do too much and ends up tripping over itself. The biggest offender is the show’s faith in the science itself being interesting. Watching animated arguments between smart, engaging people can be fun even when you have no context – the points aren’t the point, the personalities are – but only when the subject matter doesn’t smother everything else. Scientific digressions become bogged down in detail that scientists watching don’t need and other viewers don’t want. Conversation between Diego Matamoros’ measured but expressive Bohr and Kawa Ada’s flatly earnest Heisenberg loses its flow as too many arguments become office debates full of jargon and figures; it’s easy to lose sight of just how high the stakes are and just who these people are. This is all the more puzzling as both men reiterate that the goal of science is to advance human understanding not only for scientists themselves but for the layman, conveniently but condescendingly citing Bohr’s wife Margrethe (Kyra Harper) as an example. Margrethe becomes the voice of the audience thanks to a strong performance from the sidelines by Harper but also because she clearly shares our mindset: confused, a little bored, and wondering where all this is going. The show raises some intriguing ethical questions but the attempts to tie models from physics into human decision making rely on shallow philosophy and strained metaphors. The backdrop for all of this is impressive. Lorenzo Savoini’s inventive, minimalist set is framed by an ominous central pit as an angled and blurred mirror casts the stage into a grayscale kaleidoscope. The lighting interacts with this backdrop neatly, intersecting the stage with bright stripes to give life to imaginary scenery. Copenhagen can’t fully answer its own question, and embraces that fact. 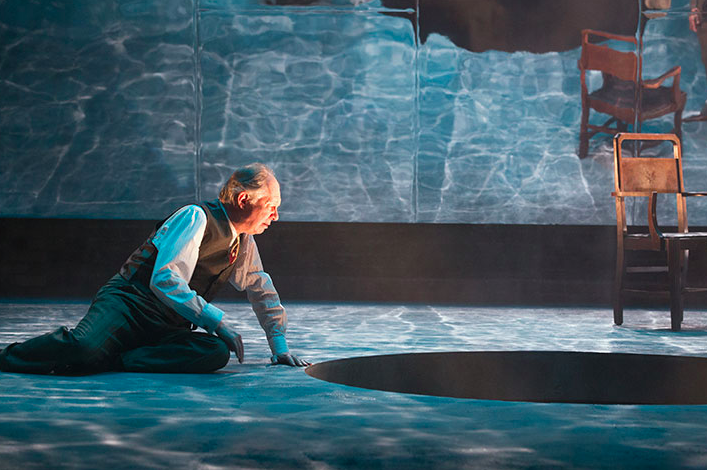 When the curtain finally falls, we don’t know for sure why Heisenberg went to meet with Bohr. I found my curiosity was exhausted by then.